The Gravitational-wave Optical Transient Observer (GOTO) will follow up on gravitational-wave measurements to pinpoint any optical trace of the source. 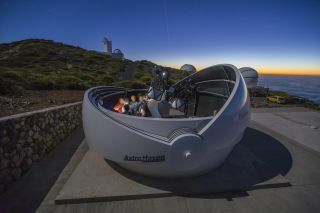 A new telescope in La Palma, in Spain's Canary Islands, coordinates with gravitational-wave detectors to track down optical signals of the colossal collisions that cause them. The Gravitational-wave Optical Transient Observer (GOTO), built as an international collaboration led by the U.K.'s University of Warwick and Australia's Monash University, was officially inaugurated July 3. GOTO will be able to respond to alerts from LIGO and other gravitational-wave detectors, and search for any optical trace of the cataclysmic events that could have caused the tiny distortions in space-time. "An optical signature might only last a day or two, so speed is of the essence," said Danny Steeghs, an astrophysicist at the University of Warwick and a lead researcher on the GOTO project. "With our field of view, we can cover the region in a couple of hours or less (depending on the constraints from LIGO for that particular event)," he told Space.com. "The hope is to catch it quickly, then follow it as it fades and also alert other, bigger telescopes so they can collect more detailed information," Steeghs added. The setup consists of a series of four 40-centimeter (16 inches) telescopes whose fields of view combine, Steeghs said. While there are four of them now, the project researchers hope to build up to eight and then, later, 16 telescopes in the array to look at even more of the sky at once. "We could then not only cover the large areas needed quickly, but also regularly survey the whole visible sky so that we know what other types of events are going on (such as unrelated supernovas) and exclude them," Steeghs said. LIGO can sense the extremely subtle impact of gravitational waves passing by Earth, but its power to triangulate their location is limited: it can only pinpoint a signal's location within about 100 square degrees of the night sky, Steeghs said. GOTO's rapid sky search could act as an intermediary between LIGO and more powerful telescopes, which need a precisely-defined location to investigate. "We've invested strongly in gravitational wave astronomy over the last few years, leading up to the first detection announced last year, and the telescope project represents a fundamentally new observational opportunity," Duncan Galloway, an astrophysicist at Monash University, said in a statement. "It's really satisfying seeing a research collaboration that we've built over many years coming to fruition in such an exciting way, and we couldn't have got here without the support of the [Monash-Warwick] Alliance and the participating universities."